Floating solar arrays are gaining popularity in Asia and Europe but have not yet caught on in the United States. That may soon change, as work has begun on a 3.2-MW floating solar array in Sayreville, New Jersey—most likely the nation’s largest. The $12 million project—developed by Power Grid Capital and engineered by RETTEW—is being built on a reservoir for the Bordentown Avenue Water Treatment Plant and should be completed before the year’s end. 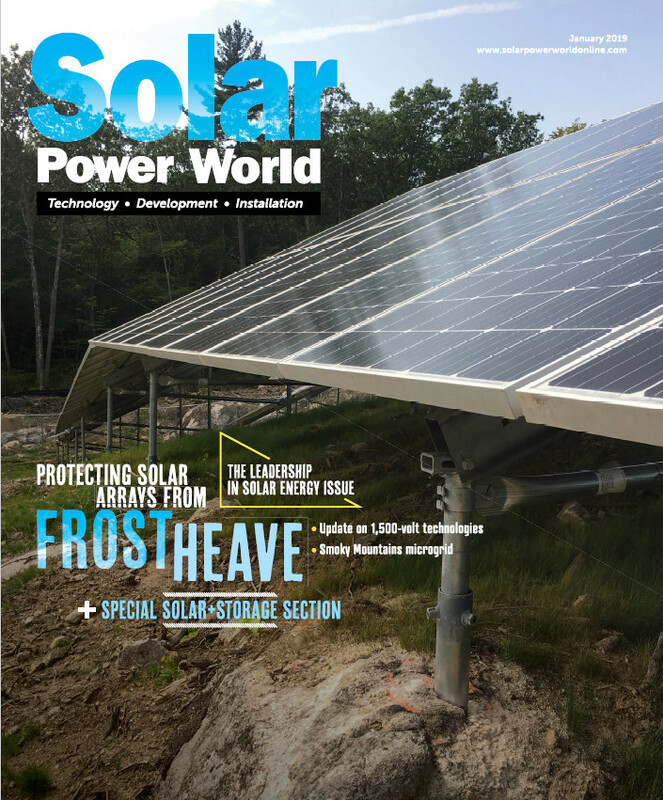 Solar Power World talked with Jason Wert, senior technical engineer for RETTEW, about the learning curve of building solar on top of water in the United States and the extra care needed for installation. What is RETTEW’s role on this floating solar array? We’re the design engineer, working for Power Grid Capital. We oversee both the design and the construction, permitting. In our traditional role as the construction oversight, we’re making sure that it’s getting installed properly and all the manufacturers requirements are being met. We’re the performance oversight, to make sure Power Grid Captial’s contractor is doing the things they should do to make sure the installation is as good as possible. How does a floating system stay on the water? The technology we’re using is very similar to the technology the Japanese are using for their floating solar arrays. The floating system is HDPE-based (plastic). If you look at some of the Kyocera projects in Japan, they link together into a mat, and each float supports one solar panel. You have an interlinked series of floating pads that support the panels. There’s an anchoring system that anchors to the shore or floating anchors. We’re doing shore mounts, so the system will be anchored to the shore line so it doesn’t move. There are access walkways to get out on the array. Is wiring tricky around water? Inverters are located on the shore side, identical to a normal ground-mount system. The system for supporting the panels integrates everything on site. We’re joining [wires] in boxes on the floating array. We’re linking together our AC circuits and are moving to shore with marine-grade submersible cable. The cables are supported by a floating system that supports the cables as they move off to the inverters. All the components we’re using are rated for a marine environment. How are the systems assembled and placed on the water? How does O&M work on floating arrays? What about extreme weather? The majority of the activities that would be completed for O&M would be accessed from the walkways by an individual wearing a life preserver. If a single panel would go bad, you have the ability to lift that panel off, walk it to the shore, replace it or repair. The system is designed to be able to ride on ice mats if needed. There’s a bit of enough flex in the anchoring system that if the lake would freeze over completely, we could ride up on the ice. What are the benefits of a floating array? There are some special considerations we’re looking at in order to increase the performance. There should be some benefits from the floating solar array that a traditional ground-mount system would not have. There is additional reflectivity. Some projects have seen reduced evaporation from the water surface. Because the solar panels are absorbing the solar energy, not as much is being transferred to the water surface. This is a non-invasive application. That’s one of the real advantages we think of the floating array. New Jersey is densely populated, and there’s parkland available that wants to be protected. We’re not consuming land for the solar array; we’re reutilizing a water surface. Floating Solar Array’s wonderful idea. And it’s very important to maintain same direction and position on the water. Because directional change of solar panels reduces electricity production. So floating solar Array also needs the directional control mooring systems for it’s parked position. Azimuth and position change of floating solar plants caused by wind, waves and external forces. RFSMS(Restoring Force Strengthened Mooring System) for floating solar Array has been created by I N I WORLD in South Korea. This Mooring System generates Restoring Force immediately when floating solar plants are being rotated or moved on the water. You can see this System in Ir-wol reservoir and O-chang Dam Floating Solar Array, South Korea. In addition, you have to reduce vibration to install floating solar plants. Because, it can make micro-cracks to floating solar panels and the durability problem of floating solar plants. The risk of power loss in PV modules due to micro cracks is increasing. New Type Floating Body Stabilizer has been created by I N I WORLD in South Korea. The Floating Body Stabilizers generate drag force immediately when floating solar plants are being rolled, pitched and yawed on the water.